Home / Amplifiers / Do microwave signal amplifiers add flicker (1/f) noise? Phase noise, and amplifier noise in particular, has been a pet project of Ferenc’s for some time. This stems from the fact that, as I will detail in a future post, a passive silicon schottky diode mixer adds very little noise. 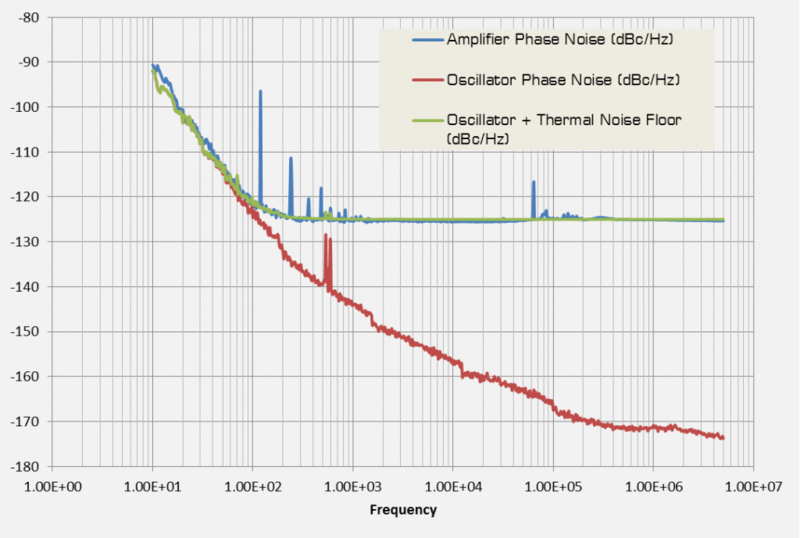 Normally when customers find excess noise on a conversion it is because of LO noise transmitting to the IF/RF output. We found a recent article called “Phase Noise in RF and Microwave Amplifiers”, by Rodolphe Boudot and Enrico Rubiola (IEEE Trans. Ultrasonics, Ferroelectrics, and Frequency Control, vol. 59, no. 12, Dec. 2012) where they show plots of phase noise of an oscillator after amplification with different output powers. We decided to perform the same measurement. In our experiment we take a reference 80 MHz oscillator (a Wenzel low phase noise crystal) and measure the phase noise. Then we attenuate the signal by 50 dB and amplify it back up by 50 dB. The input noise floor is at -159.4 dBm/Hz, and the output is at 106.5 dBm/Hz. The noise floor increase is as a result of the amplification and noise figure of the amplifier. The phase noise plots are show below, along with an extra line showing the phase noise of the oscillator with a constant noise level equal to the noise floor of the amplifier added to it. As you can see, there is very little difference between the phase noise of the amplified signal and the phase noise of the oscillator with white noise added to it. Hence the question, do amplifiers add flicker noise? In the frequency range near the carrier we see hardly any noise addition. This suggest that at a minimum, the flicker noise addition for the amplifier we used (a Centellax wideband amplifier similar to our T3 driver amps) is very low. So low that it’s hard for us to believe that it adds flicker noise at all.